I’ve been asked quite a lot to give an example of a presentation handout. That’s why I’m presenting one of the first handouts that I have created here. To Download the presentation handout sample (in PDF), click on the image below or download presentation handout. To see the presentation for this handout, go to ReThinking Presentation Design. You can also see the content of the handout below the image. Presentations (especially using slideware such as Microsoft PowerPoint or Apple’s Keynote) are getting more and more common. Unfortunately, people tend to misuse PowerPoint and create horrible presentations. Presentations are supposed to communicate a message, but many people use PowerPoint to show facts and nice slides without having a story or a main point. This first edition of “Present!” tries to take a look on how to improve on this by ReThinking Presentation Design. If you are used to seeing Presentation slides full of text and packed with images, bullet points and cliparts, you should try to forget these old presentation habits. There are also some common “tips” that you should ignore such as the 1-7-7 Rule (1 Slide -> 7 Lines/Slide -> 7 Words/Line), or showing a slide for 40 seconds before going to the next! You should try to let go of these “techniques” as they can prevent you from doing really great presentations. When you start creating new presentation slides (e.g. with PowerPoint), avoid the generic PowerPoint templates (such as the default text boxes or pre-set background colors) as they will restrain your ideas and creativity. You should start with a blank slide or better: Start with blank sheets of paper and begin “offline”! There’s a limited amount of information that people can soak in at a given time. This is why it’s important to only have one core message in your presentation. How many times have you seen presentations that don’t have an actual message but are just about showing a lot of numbers and facts? You then read a lot of details and it’s hard to condense it into a memorizable thing. How much of the presentation will you still remember tomorrow? It might be hard to put what you want to talk about into one core message, but it will be worth it, because people will remember it. Telling stories is a great way to deliver a message. In a story you should have a storyline that goes from one point to the next, connecting the points into one whole. Great stories can make a presentation memorable. And even if you can’t design slides, great stories outweigh bad slides. But bad slides don’t outweigh a bad story (I had to painfully experience this myself). So first find out the core message that you want to communicate; and then craft a story that delivers this message. Only in the last step do you create the slides. These are 3 important points you should keep in mind when creating a presentation. 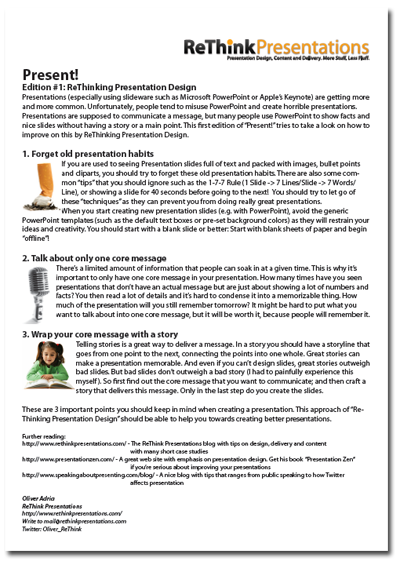 This approach of “Re-Thinking Presentation Design” should be able to help you towards creating better presentations.